Six days grand sale will end on March 17, the international top brand's sale began yesterday, held at the World Trade Center. A huge discount like never before at clothes and accomplices for as low as Dh10. 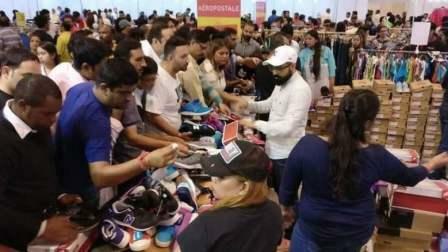 The last day 17 march you can avail the chance of the huge sale of the top brands at Head to Sheikh Rashid Hall A & B at Dubai World Trade Centre. Aldo, Divage, Bourjois, Guess, Max Factor X, Bvlgari, Blanco, Cortefiel, Gucci, Tom Ford, Cello, Mont Blanc brands and many more.